The contest is open to all 6th, 7th, & 8th grade students. Participants must write their essay themselves, but they may get help from teachers, parents, or friends in the form of ideas. Poster paper: Ideally, posters should be submitted on 8½” × 11″ inch paper. However, posters submitted on paper up to 11×24 inches in size will be accepted. Please contact your local Elks Lodge for additional information, as some areas might have additional criteria. 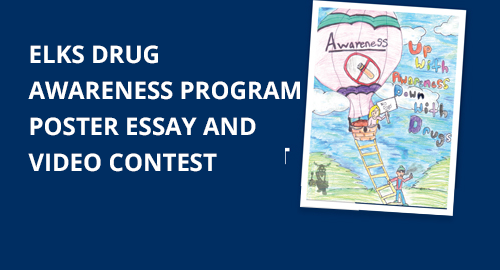 Learn more about the Elks Drug Awareness Poster Contest for students in third through fifth grade, by visiting elks.org/dap/poster.cfm. Your artwork could end up in a coloring book, too! The contest is open to three age groups, Pre-high school, High School and Post Graduates. Lodge for additional information, as some areas might have additional criteria. Learn more about the Elks Drug Awareness Video Contest, by visiting elks.org/dap/videoContest.cfm. Your video could end up on elkskidszone, too! Please check with your state association state drug awareness chair for your state’s rules and timeframe.